As I prepare myself for going back to Uni, I have those first day at school feels. Will the other kids like me? Do I have the right books? Do I have enough clothes? It's a nightmare! But I am here to help you get back to school with confidence. I use to hate school uniform but the high street have cottoned on to the struggles since I was in the classroom and they provide some great black skirts and a range of shirts. No longer do you have to suffer the tough shirts. H&M have a strong work wear range with a variety of shirts. I prefer the sheer shirts as they're light and floaty. Add a cami top or a crop top for extra details. You can pick up some great structured skirts which gives your outfit a catwalk feel. You can stride down the corridors like the power hungry learner you are! You own that classroom! Keep that motivation going by getting some fun and quirky stationary. 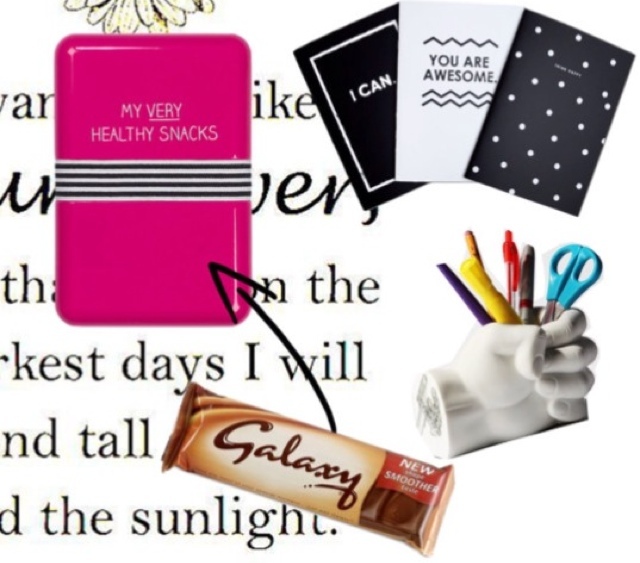 You will definitely want to write in a motivating notebook with some pretty pens. Of course, rules are meant to be broken, so keep your chocolate in the "healthy snacks" lunch box which you can get from Clair Accessories. Ooh you rebel! Most of all, have fun and work hard. Enjoy your year!